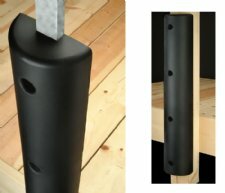 C-Marine 48" long foam dock bumpers, with a 3.5" channel, are made from a solid urethane "memory" foam elastomer. Will not mark or mar your hull. Available in BLACK only. Dimensions: 7 1/4" W x 3 3/4" H x 46 3/4" L.
Dimensions: Actual Dimensions: 7 1/2" W x 3 3/4" H x 46 3/4" L (with a 3.5" Channel). Hasfour pre-molded holes for mounting, every 8" on center.